Jorge is partner at the firm since 2001 and he specializes in M&A, Project Finance, Private Equity, Energy and Infrastructure transactions. 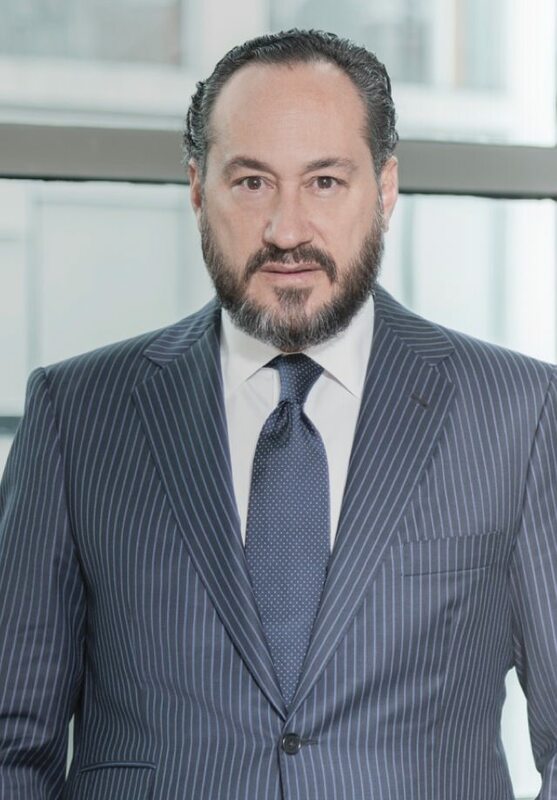 He has extensive experience and knowledge advising parties in a wide range of complex national and cross-border projects in Mexico, representing sponsors, developers, investors, financial institutions, banks, lenders and governments on all kinds of acquisitions, dispositions, joint ventures, projects and financings. His experience encompasses a broad range of transactional and regulatory work and has included some very relevant transactions involving oil and gas, power generation, renewable energy, petrochemicals, LNG, pipelines, telecommunications, real estate, hotels and infrastructure projects in general. Represented Citigroup, Sumitomo Mitsui Banking Corporation, BNP Paribas, JPMorgan Chase, and The Bank of Nova Scotia, acting as Joint Lead Arrangers and Joint Bookrunners in a simultaneous syndicated credit facility and a Rule 144A / Reg. S bond offering to allow private equity fund Actis to successfully complete its acquisition of global power-generation company InterGen’s business interests in Mexico, including the purchase of 2,200 MWs in operation with six combined-cycle power generation projects, a 155 MW wind project with partner IEnova, a 65-kilometer natural-gas pipeline, and 3 natural gas-compression stations, for an enterprise value of US$1.256 billion. This is the first time that a project acquisition in Mexico of this size is executed with the use of bond proceeds. This transaction was named Best Infrastructure Financing in Mexico by Latin Finance in the Project & Infrastructure Finance Awards 2018, Mexico Structured Bond Deal of the Year by GFC Media Group in the Bonds & Loans Awards 2019 and Latin American M&A deal of the Year 2018 by IJ Global (Euromoney). Represented Macquarie Capital and Techint, as sponsors, in the highly complex USD$1.2 billion acquisition, development and project financing of the landmark 907MW Norte III power plant in Mexico, which will generate power for the Federal Electricity Commission pursuant to a 25-year PPA. This transaction was named LATAM Power Deal of the Year by Project Finance International (Thompson Reuters); Latin American Power & Overall Deal of the Year by IJ Global (Euromoney); Project Finance Deal of the Year by Latin Lawyer and Best Power Financing Deal by Latin Finance in the Project & Infrastructure Finance Awards 2018. Represented Global Infrastructure Partners, as lenders, in the security structuring and negotiation of a multimillion credit facility granted to Blue Marine Capital, for the construction of a floating, production, storage and offloading unit (FPSO) to receive solids, liquids (crude oil, reaction products and formation waters) and gases originating from Pemex oil-well operations, under a long-term multiple services agreement executed with Pemex Exploración y Producción. Represented Natixis and Credit Agricole (CA-CIB), as Mandated Lead Arrangers and Issuing Banks, in the negotiation of a syndicated credit facility and Mexican security package for US$100m, granted to Energía Renovable de la Península (a subsidiary of Grupo Cobra), for the development and financing of a 92.4MW wind farm project located in the Yucatan Peninsula, which holds several PPAs awarded as a result of first long-term auctions from renewable energy sources of the CENACE. Represented Macquarie Capital in the USD$56 million sale to an SPV of InfraRed Capital Partners and Invex Infraestructura, of a 45.5% stake in Norte III Power, S.A.P.I., which owns the 907 MW Norte III power plant in Mexico for the generation of electricity for the Federal Electricity Commission pursuant to a 25-year PPA. Counsel to a subsidiary of Chevron Corporation in connection with the negotiation and execution of a long-term Terminal Services Agreement with an affiliate of Infraestructura Energética Nova, S.A.B. de C.V. for the storage of gasolines and diesel in a new USD$130 million refined products terminal in the State of Baja California in northern Mexico, as well as in related agreements for an option to acquire 20% of the equity of the terminal. Represented Chevron Combustibles de México in connection with a long-term storage contract for gasoline and diesel in a new terminal to be built by IEnova in the API of Topolobampo, Mexico.